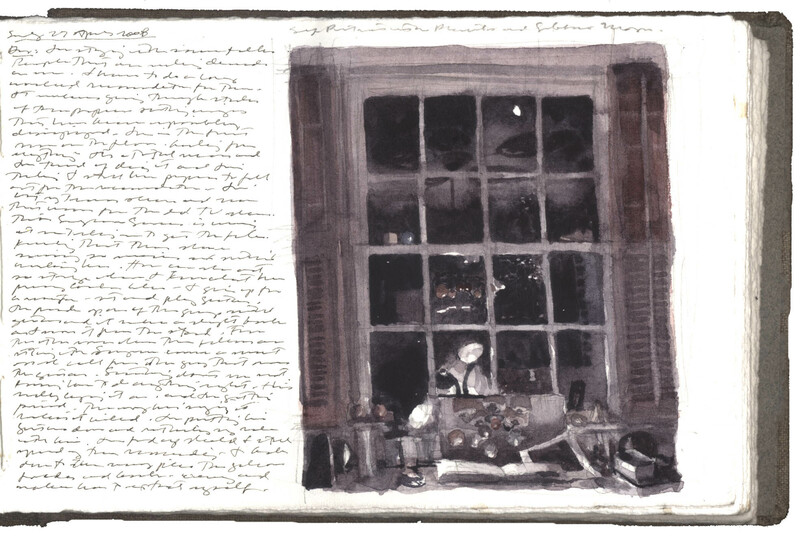 Study from Book 130, Self-Portrait with Planets and Gibbous Moon, 2008, watercolor, graphite, and pen and ink on Arches paper in bound volume, 4 x 6″. This watercolor study was executed using two colors; Indigo and Raw Umber Violet. Around 1980 I abandoned color. It wasn’t hard for me as I was no extravagant colorist. I grew up cultivating the practice of pen and black ink, keeping pen and fingertips in the medium to explore the topography of the page. The challenge of placing dark irrevocable marks against bright paper was for me; get it right the first time or else. Color seemed superfluous to my practice. Living in Pittsburgh, Pennsylvania must have stirred some of my fascination with light and dark. I had traded a life in the suburban south for a stint in the urban north and bumped against a different universe. Pittsburgh had a mini-Manhattan setting; an island between rivers that stretched to steep hillsides. By day the topography was dark and rich, from steely to earthy warm; particularly in winter when the snows patterned the earth. But at night the city was transcendental; I felt I was driving through a box of stars, tracing the water’s edge, parking my car at intervals to make studies (see Pittsburgh Night image below). On clear nights the lights of buildings, bridges, and highways reflected off the water, earth, and sky it seemed. Black and white was all I needed. Move forward twenty years. Who knows why self-imposed limitations are outgrown; the blue sky needs demarcation from brown earth. After trying multiple combinations to make gray I discover one that makes black: Indigo and Raw Umber Violet (see photograph below). This discovery offered reasons to articulate warm and cool. Perhaps this eureka launched me on a path toward more color. Or perhaps I’m on my way to deeper blacks. I’m still on the trail. 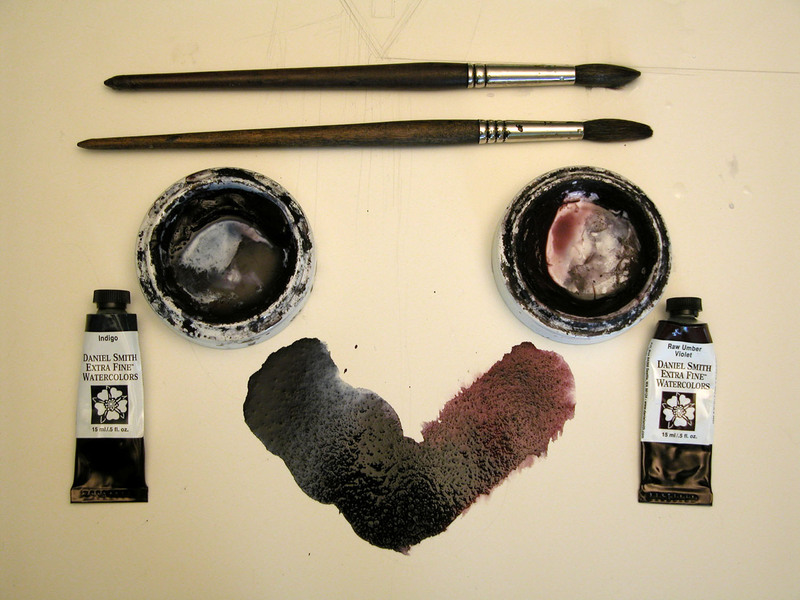 (Below) Photograph of watercolors Indigo (left) and Raw Umber Violet (right) mixing to near-black. 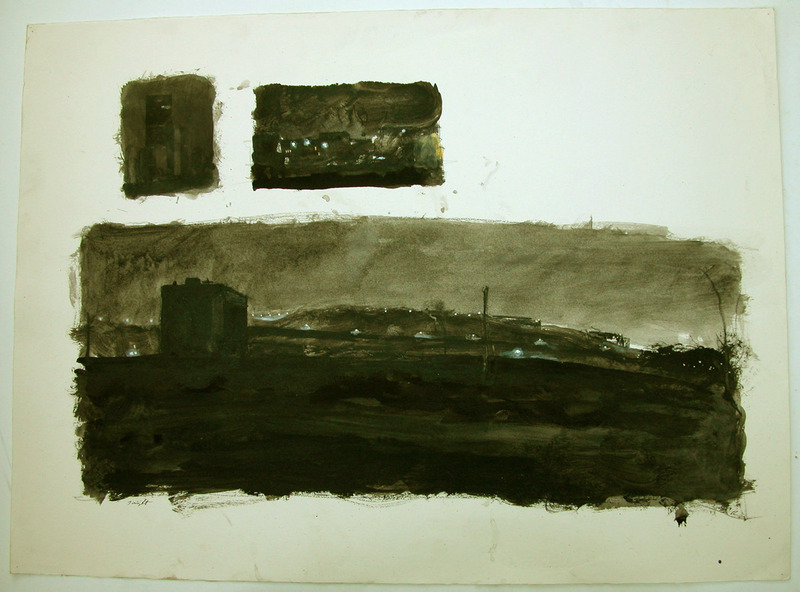 Charles Ritchie, Pittsburgh Night Series: Number 1, c. 1978, 23 x 30, black and white acrylic paint with acrylic matte medium and lithographic crayon on Fabriano paper, uncatalogued.